I was lucky enough to score some free herbs this week, herbs that had reached their use by date, herbs that would otherwise have ended up as landfill. good light at the best of times and today is overcast and grey. Welcome to this month's Garden Share Collective hosted by Kate from Rosehips and Rhubarb and Krystie from A Fresh Legacy, this month the theme is SAVE. I had absolutely no idea what I was going to write about this month, and after tossing around a few ideas (saving seeds, saving produce, saving money) I finally decided to do a post on saving bees. It shouldn't be news to any gardener that the world honey bee population is on the decline, climate change, loss of habitat, the use of pesticides containing neonicotinoids and the varroa mite are all playing a part in their decline. Every year in Australia about 48 millions tyres reach the end of the road, of those 48 million, only 16% are recycled, the rest end up in landfill, stockpiled or illegally dumped. Anything that can be done to reduce the number of tyres ending up in landfill can only be a good thing. Below are just a few examples of what can be done with them. 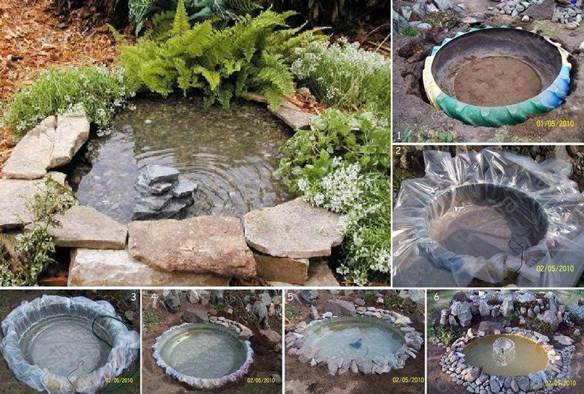 From icreativeideas comes an idea I might try myself as I have been trying to think of a cheap way to add a frog pond down in the vegetable garden. It seems that I'm not happy unless I'm changing things around, I was certainly not happy with the way the vegetable garden was looking. I have been wanting to add more flowers to the vegetable garden for a while now so I sacrificed just over two metres of growing space for that purpose, which still left me with ten garden beds. When my girls gave me a greenhouse for my birthday I thought it would look good in the middle of what would become the flower garden. I also added my two plums trees and an insect hotel as well as three Salvias "Joan", "Hot Lips" and an unnamed blue one, Senicio "Vira Vira" and a Lion's Ear plant. The space very quickly became too crowded and getting in to water the plants and fill up the bee/butterfly dish behind the plum trees was quite difficult.